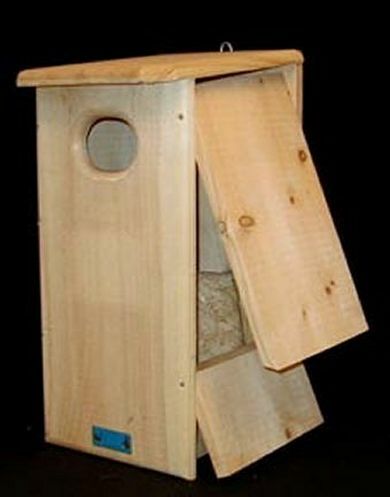 This Wood Duck House opens two ways for observation and cleaning, and has an internal ladder for the duckings to climb out. Mother calls ducklings to the protection of the open water at age one day. RANGE: Breeds from British Columbia south to California, and from Montana east to Nova Scotia, and south to Texas and Florida; absent from Rocky Mountains and Great Plains. Winters near Pacific Coast north to Washington, and to New Jersey in East, rarely further north. HABITAT: Nests beside wooded rivers and ponds. Visits freshwater marshes in late summer and fall. Dimensions: 24 1/4 in. x 11 in. x 15 in. Hole Size: 3 in. x 4 in.